Instana Dynamic APM discovers, maps and monitors applications built in containers both in and out of the Cloud. Supports 10 languages and 65+ technologies. Discover map and monitor modern dynamic applications, regardless of how they are built - in the cloud, in containers, or even microservices. Continuously update applications maps in real time when changes occur. Leverage artificial intelligence to select KPIs, identify service incidents, and automate root cause analysis. With containers, the only constant is change. Instana automatically discovers & maps all application components and automatically updates the maps when changes occur. Components and containers can spin up and decommission in an instant. Metric granularity longer than one second leads to missing data and – worse – missing problems. With Instana, you will never wait to see if a new container behaves properly. Real-time notification allows you to instantly see any deployment problems so that you can roll back or fix immediately. Every request is important in its own way – and every request has the potential to fail or slow down. To guarantee that every bad trace is captured for debugging, Instana traces every single request. 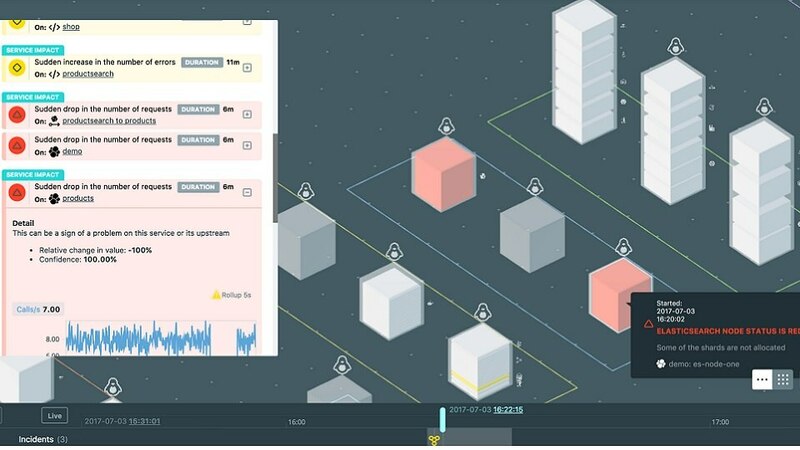 Instana deals with the sheer scale, complexity and dynamic nature of containerized apps by filtering out extraneous systems and requests, focusing only on the systems you’re investigating. As App elements exponentially grow, humans can no longer manually manage Apps. Instana leverages AI to automatically select KPIs, identify problems and find the root cause - without human interaction.